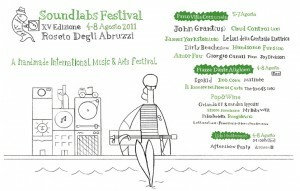 Talking about a very beautiful Italian region, Abruzzo, we want to tell about a nice summer festival on the coast: Soundlabs Festival. The evnt comes back to its traditional summer dates in Roseto degli Abruzzi this year, after a September slot of events taken place last year. Our beginnings lie in the distant past. Born in 1997, this indie, “little festival” with free entry for emerging bands developed into the Soundlabs Festival in 2003. 100 international “big” names have taken part in this fab festival , over the past 13 years, such as: Patti Smith, Mogwai, Blonde Redhead, Calexico, José Gonzalez, Glasvegas, Wire, Liars, Micah P. Hinson, Art Brut, Girls in Hawaii, Enon, Afterhours, Verdena, Baustelle, Zu, Linea 77, Marlene Kuntz, Giardini di Miro’, Offlaga Disco Pax. 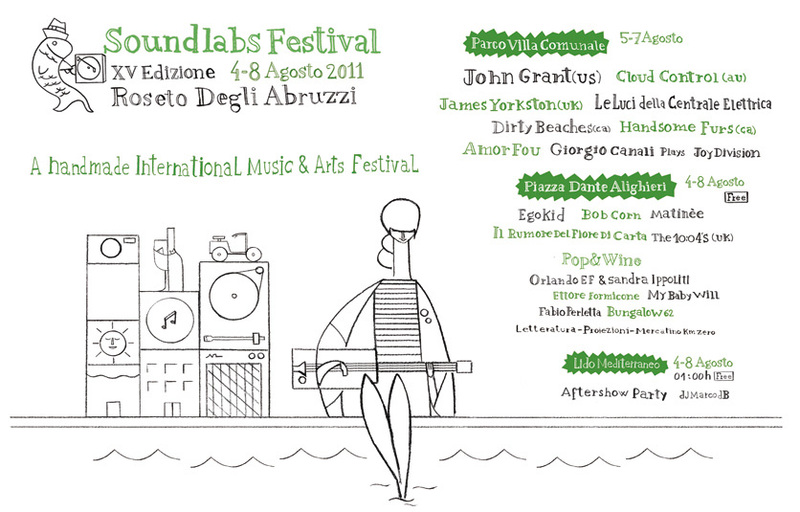 The 2011 Soundlabs Festival—the 15th edition— will take place on August 4th till 8th at a different venue respect on the other years! The usual one, the Stadio Fonte dell’Olmo in Roseto degli Abruzzi, is changed and now the events will be displayed between Piazza Dante and the Villa Comunale. The stars on stage this year will be: John Grant, James Yorkston, Dirty Beaches, Handsome Furs, Le Luci Della Centrale Elettrica, Amour Fou, Bob Corn, Giorgio Canali, Clear Clouds and many others. Meaning this year Soundlabs will range from the pchydelic pop of the Australian Clear Clouds to the dark, deep atmosphere of postpunk and garage rock/rockabilly to the indie folk. In particular, John Grant with his debut album “Queen of Denmark”, (Bella Union) is a very exciting event to be in! “Mojo” put Grant’s songs within the 5 top album of 2010! A word on the location: Roseto degli Abruzzi’s set near the gorgeous Adriatic coast. So you can enjoy both the seaside, the beaches and the sun in the morning, the region’s great foods and wines offer in the evening, together with the music of this funny and interesting summer festival!! So put together great sounds, great food and great seaside with Soundlabs Festival! This entry was posted on Saturday, July 30th, 2011 at 2:27 pm	and is filed under Events in Italy. You can follow any responses to this entry through the RSS 2.0 feed. You can leave a response, or trackback from your own site.